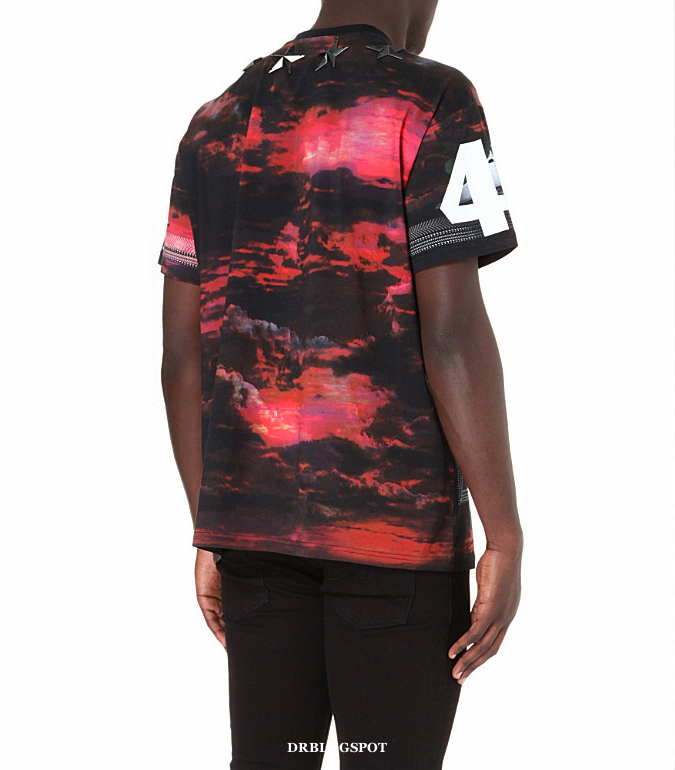 The Givenchy Red Fighter T-Shirt is probably one of the hottest menswear tee of Spring Summer 2013. 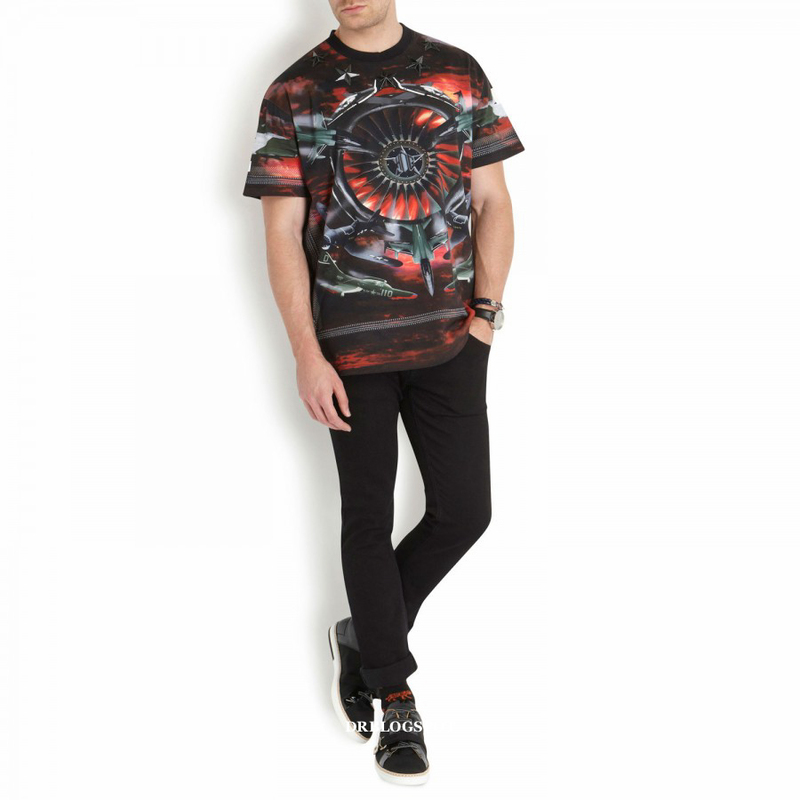 This t-shirt is so popularly demanded that all the sizes are successfully sold out within minutes of listing. 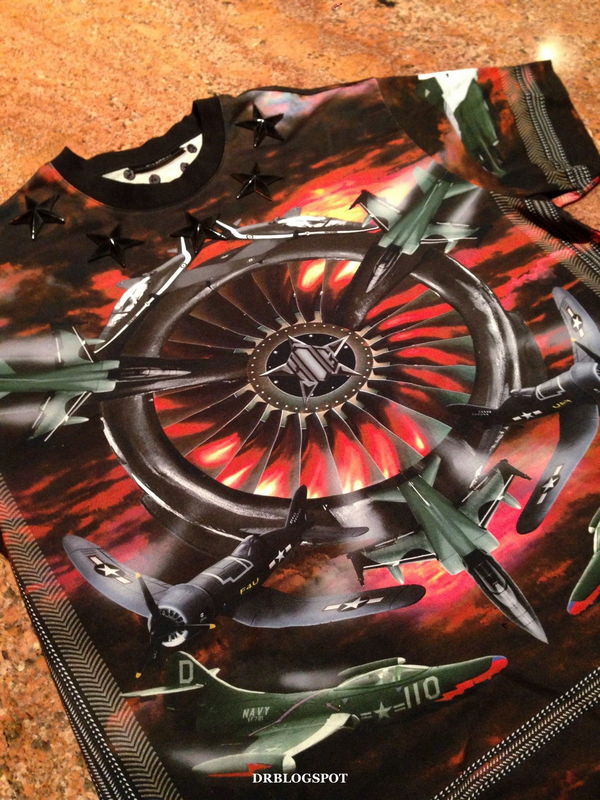 Since it’s first inception on the luxury retail market, Luisa Via Roma was the first global online retailer to offer a pre-order purchase of the Givenchy Red Fighter T-Shirt – also commonly known as ‘Givenchy Horn Stars Jersey Oversized T-Shirt’ at the Florence, Italy store during early December 2012. 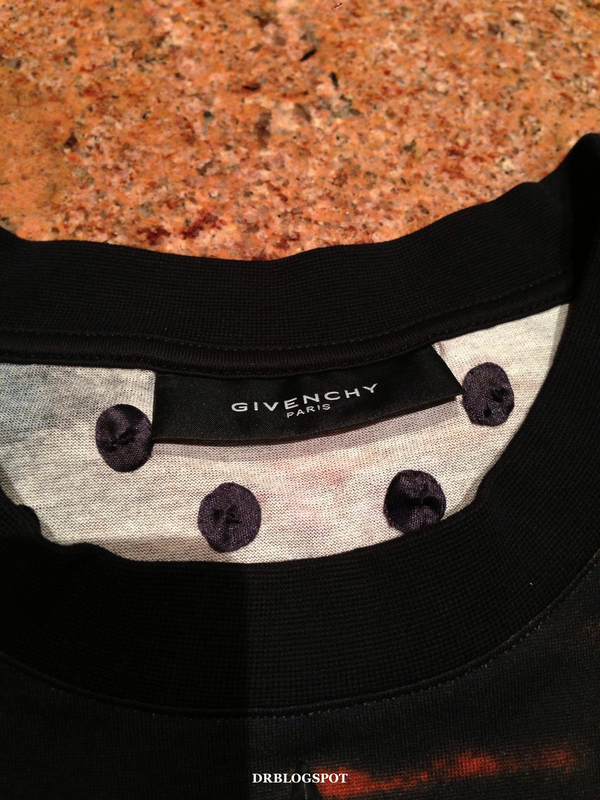 A friend of mine based in Singapore who is a Givenchy fanatic manage to pre-order it in time. He was one of the lucky buyers who were quick enough to checkout before anyone else did. 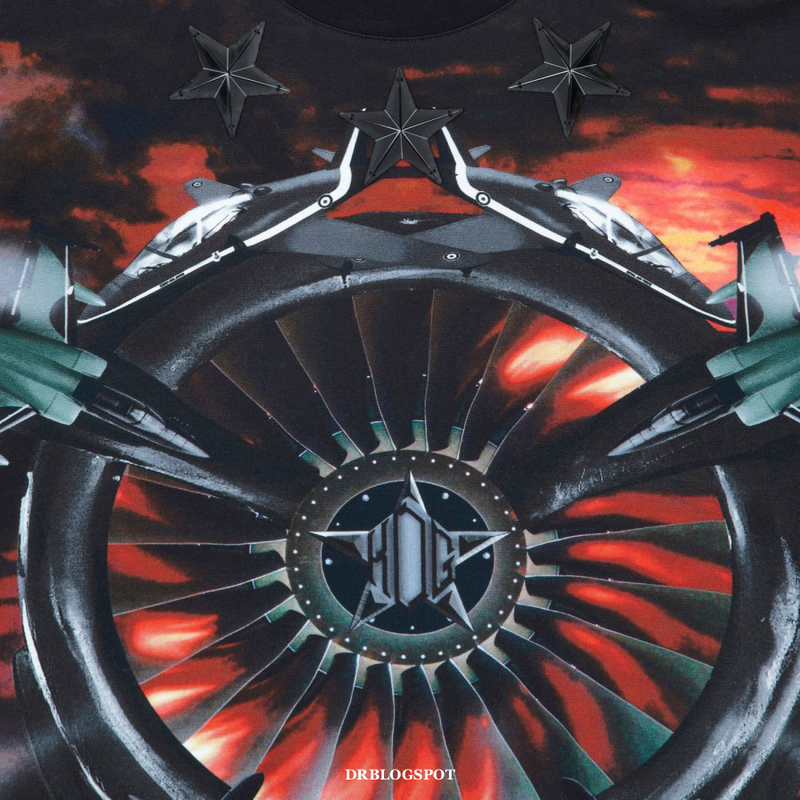 By the time word has spread throughout the internet about Luisa Via Roma’s Givenchy Spring Summer 2013 Pre-Order Collection, the Givenchy Red Fighter T-Shirt was long gone and has never been restocked again. 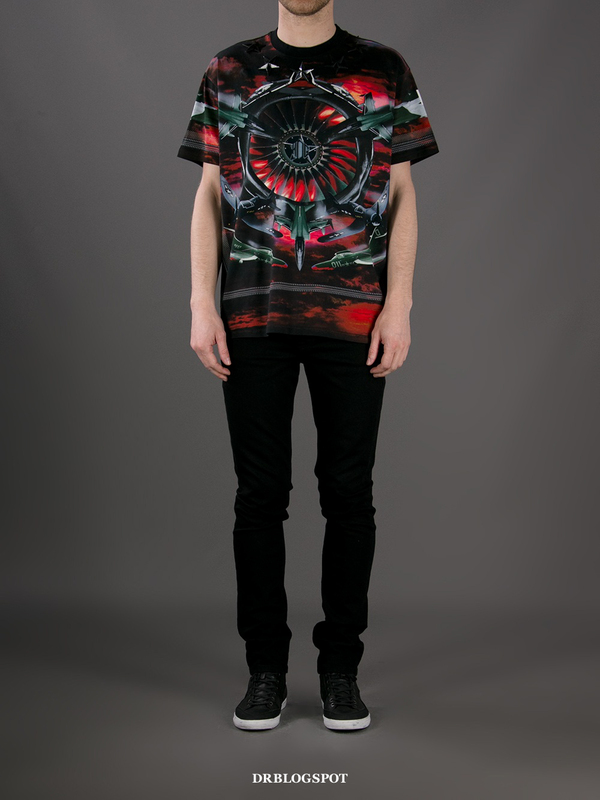 After many months of absent, the Givenchy Red Fighter T-Shirt was stocked and listed worldwide online and in-stores during mid to late April 2013. 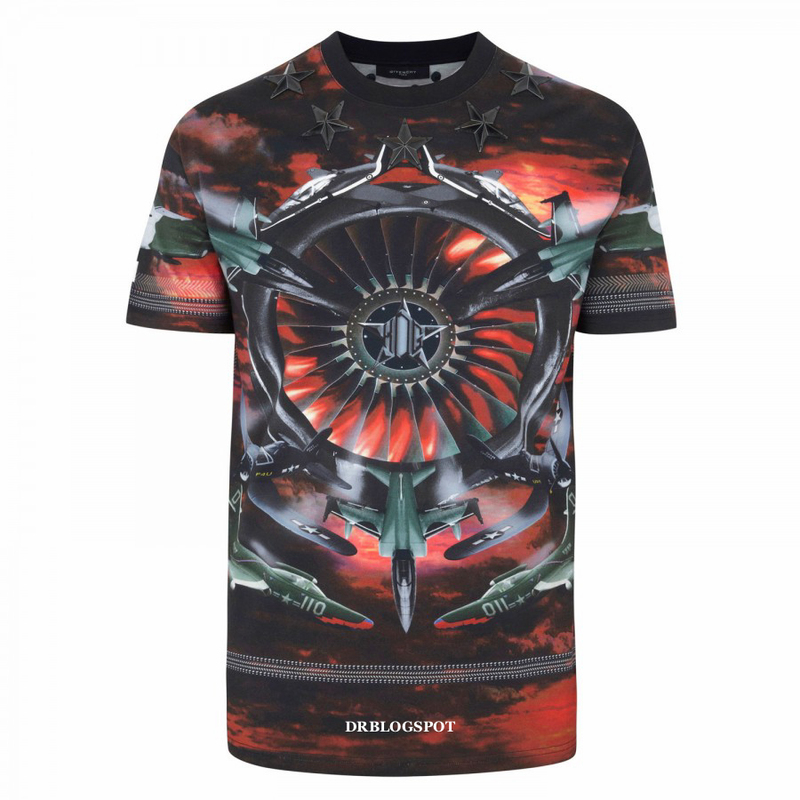 A number of luxury online retailers such as, SSENSE.com – ‘Givenchy Red Airplane Print Star-Embroidered T-Shirt’, Farfetch Capsule By Eso – ‘Givenchy Fighter Jet Printed T-Shirt’, Harvey Nicholas – ‘Givenchy Star Appliqué Printed T-shirt’ and Selfridges & Co – ‘Givenchy Printed Star Appliqué Cotton T-Shirt’ sells the Givenchy Red Fighter T-Shirt. 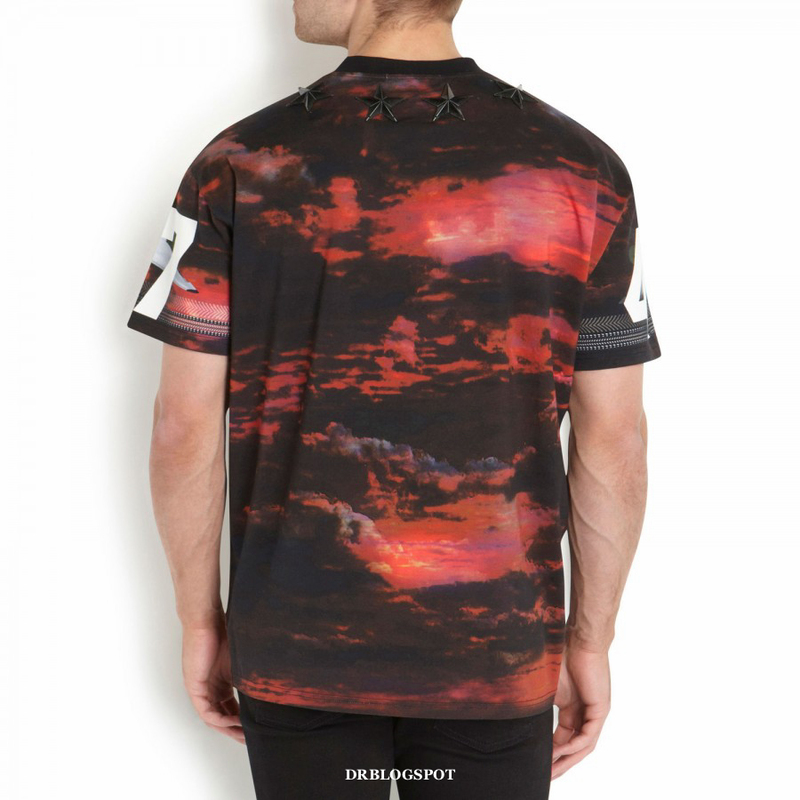 It is currently stocked by Melium Group Givenchy Malaysia at Pavilion Kuala Lumpur – ‘Givenchy Burgundy Stars Application T-Shirt’ for 3,600 MYR – privately showcased and sold to their loyal Malaysian cliental. 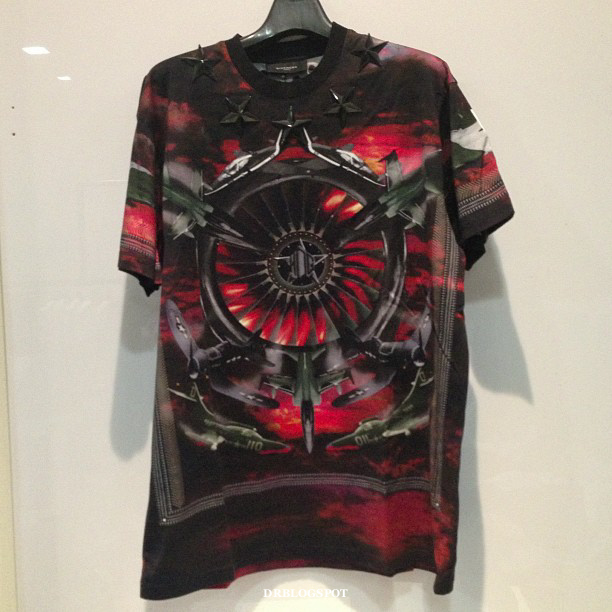 You might be wondering what is so special about this Givenchy Red Fighter T-shirt that everyone wants so badly? 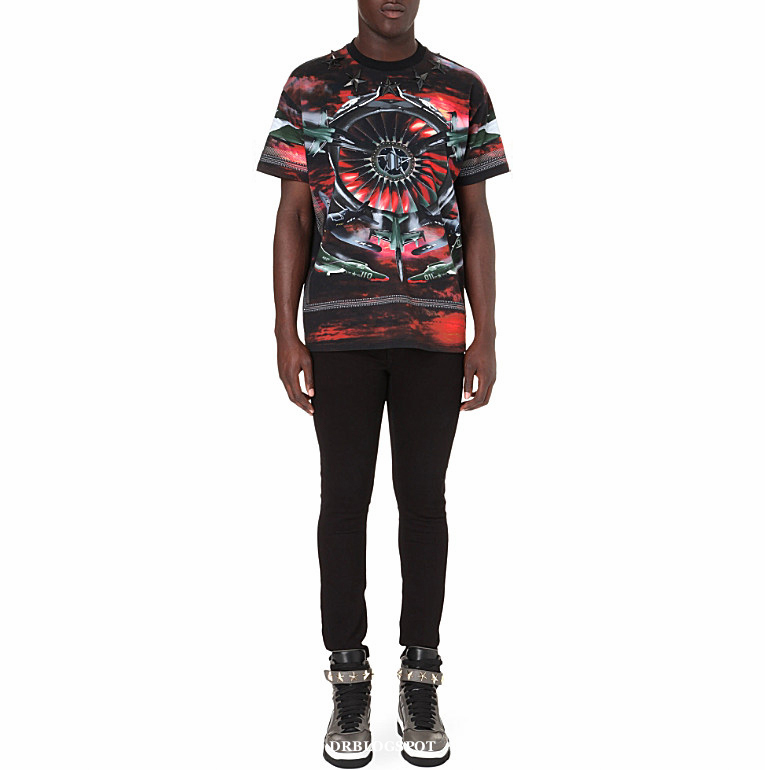 The Givenchy Red Fighter’s popularity was largely gained much earlier in December 2012 because of its exclusivity which was not featured at the Givenchy Pre-Spring 2013 Look Book. 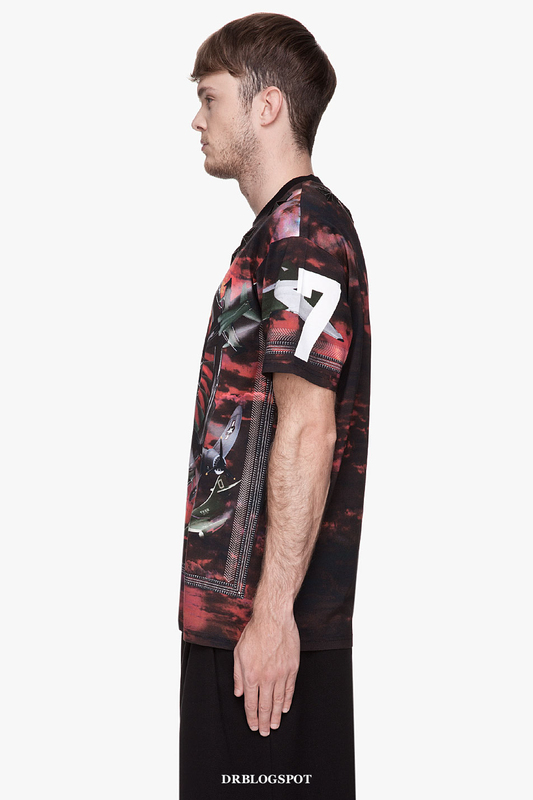 The most attractive extend of the Givenchy Red Fighter T-shirt from my personal opinion is not the comprehensive design. 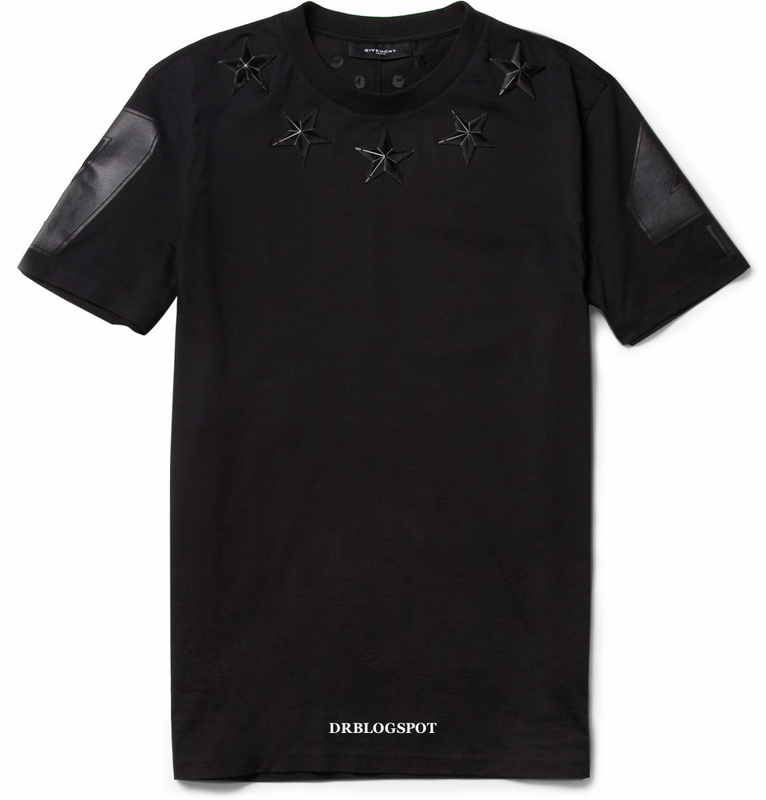 Styled with the exclusive signature glossy black metal stars-embroidered appliqué that has previously gained popularity concurrent with the Givenchy Star-Detail Cotton-Jersey T-Shirt which was also sold out within minutes on MR PORTER. 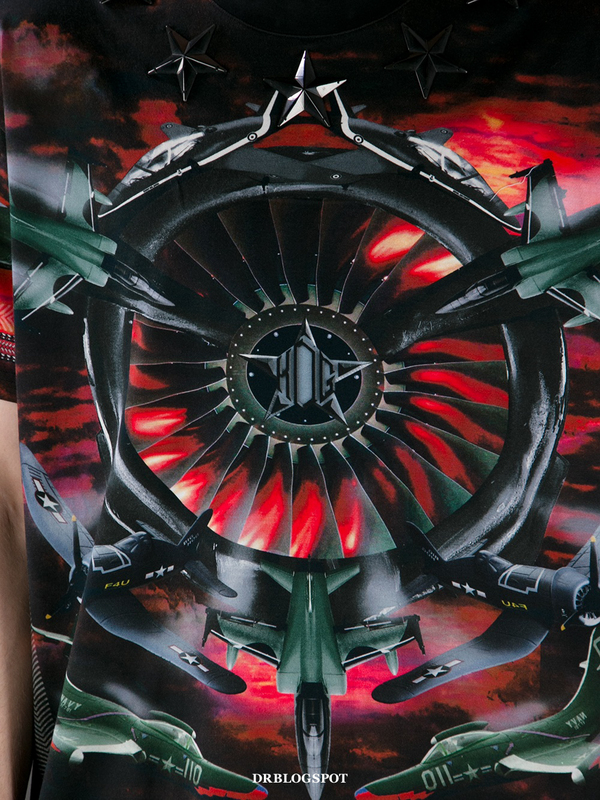 Nobody really knew that Givenchy was going to offer this design combo for the following season, not until Kenzo Tokgoz uploaded a photo of himself wearing the Givenchy Red Fighter T-Shirt on his Tumblr’s account that went viral on social media websites. 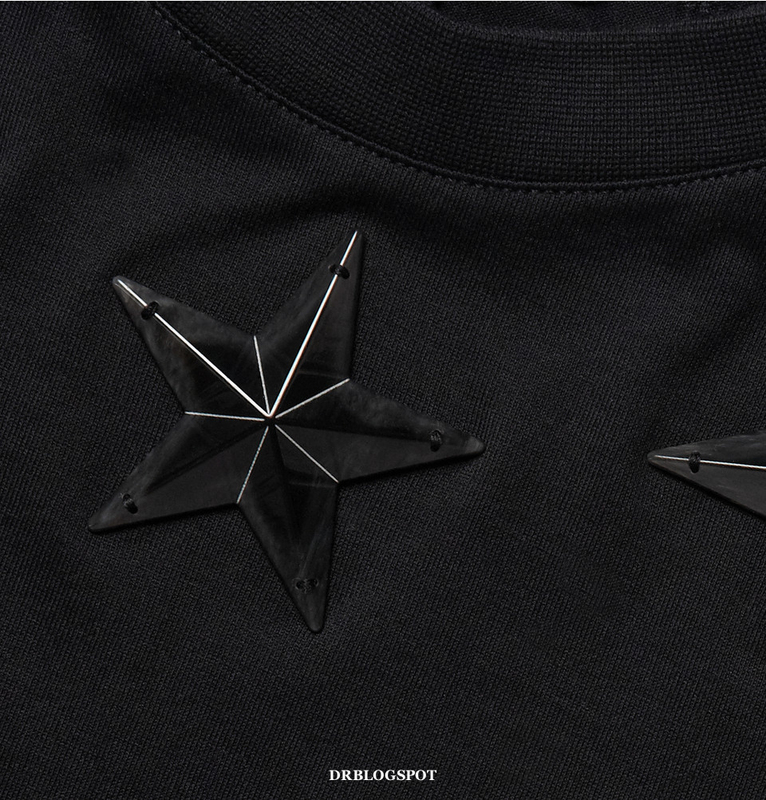 Source: MR PORTER – ‘Givenchy Star-Detail Cotton-Jersey T-Shirt’. 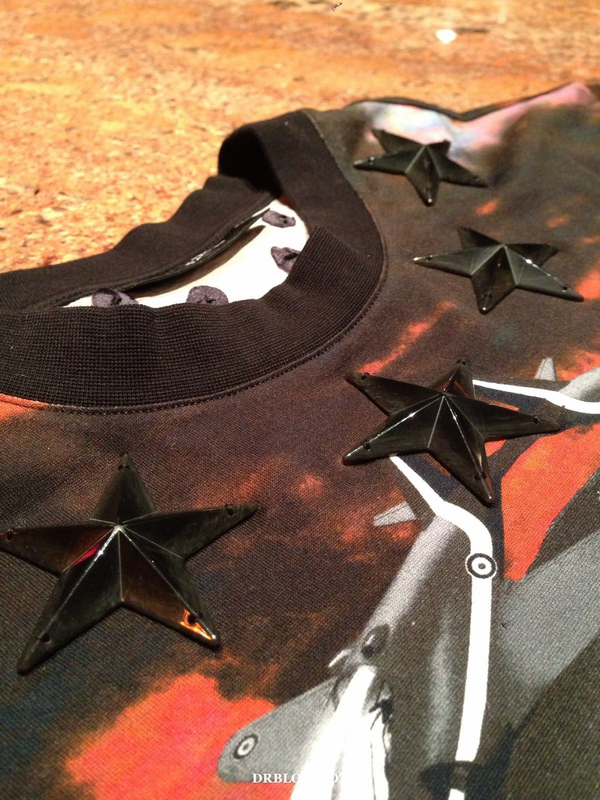 Proven sales success last year 2012 with Givenchy t-shirts featuring the black glossy star appliqué. 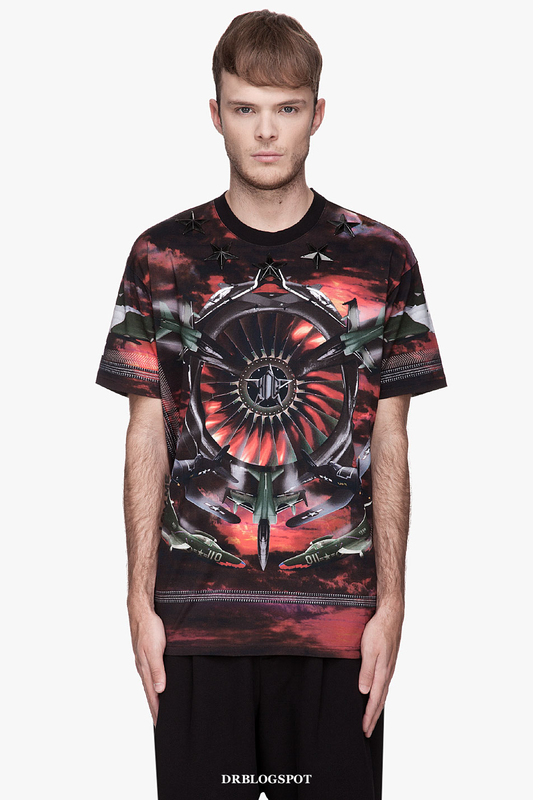 The conceptual canvas is graphically hand painted by Riccardo Tisci with a couple of jet fighters and WW2 warplanes inspired from the 20th century that looks as if it was horizontally flipped in Photoshop and paste at various strategic positions. 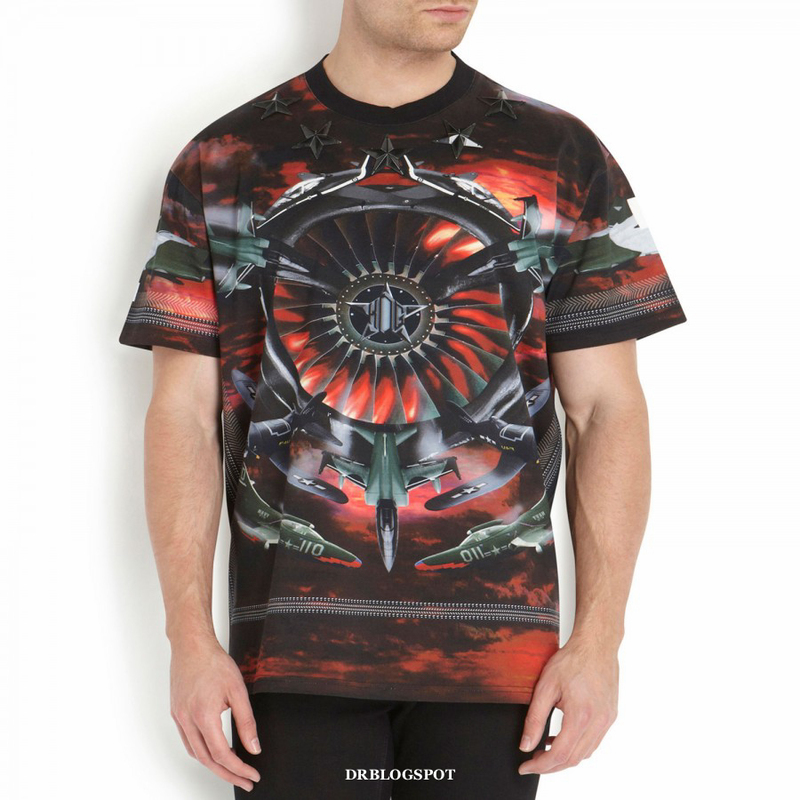 It has less printed elements compared to the prominent Givenchy Green Fighter that drives the characteristics of Pre-Spring 2013 collection, on the other hand it is the only t-shirt from Givenchy Pre-Spring 2012 featuring modern warplanes. 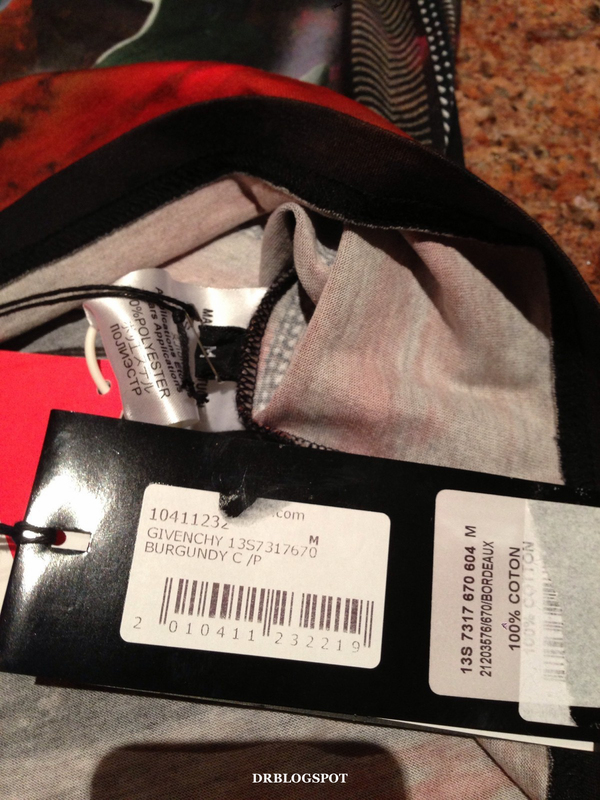 The Givenchy Red Fighter’s design is a secondary rendition made after the main Givenchy Green Fighter to be upmarket at a much premium price point. 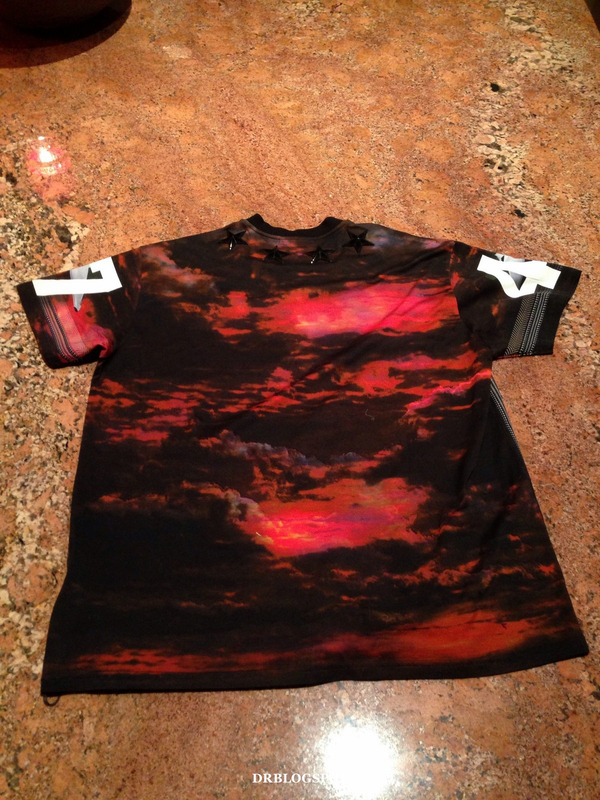 With the various strategic price points and exclusive design offerings by Givenchy has proven sales success for the Pre-Spring 2013 t-shirt collection. 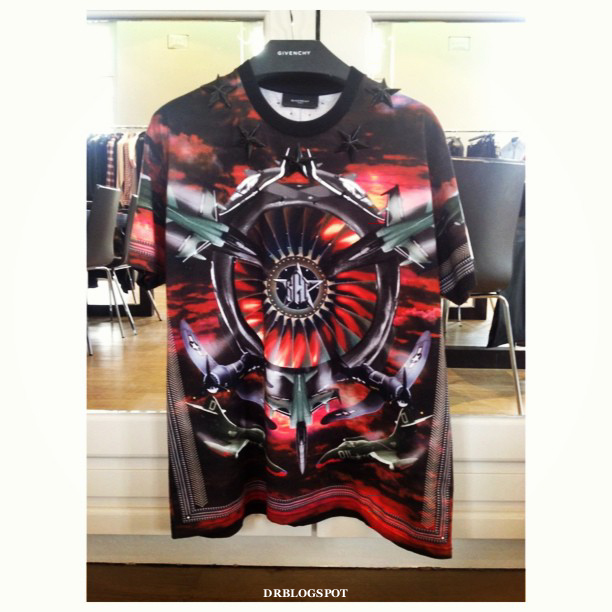 Read more about the Givenchy Green Fighter T-Shirt here at DRBLOGSPOT. 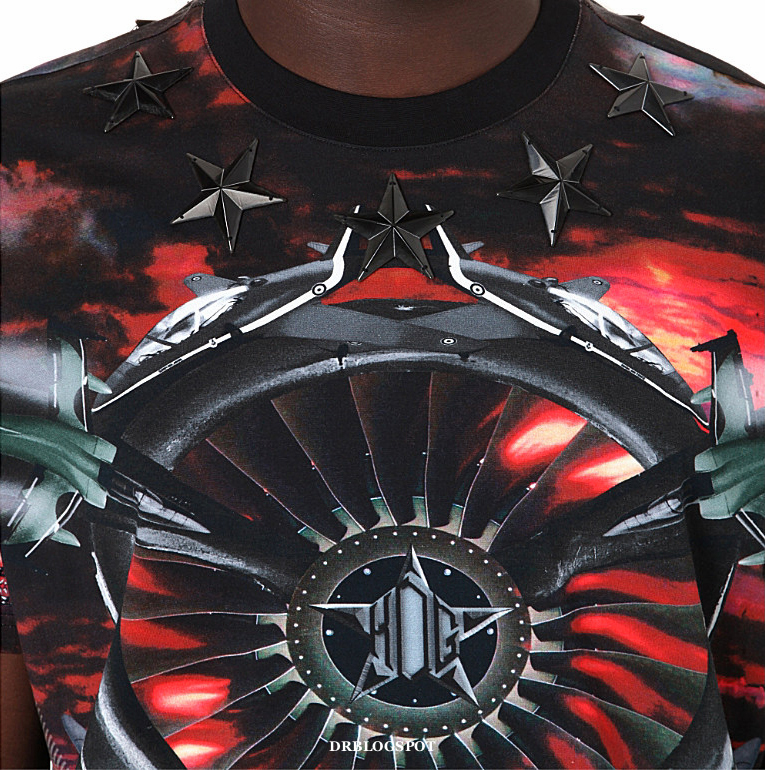 SSENSE – Givenchy Red Airplane Print Star-Embroidered T-Shirt. 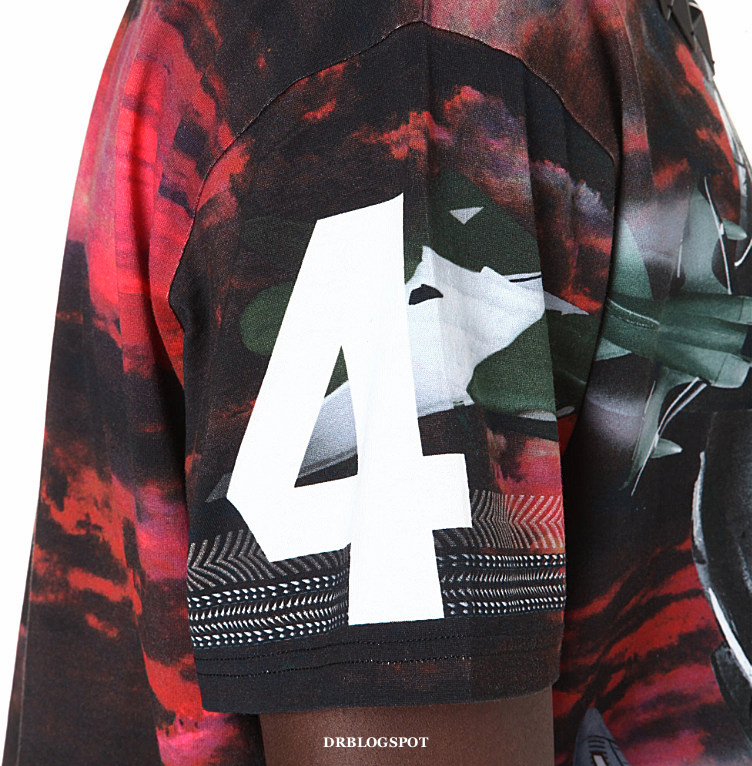 Boxy short sleeve t-shirt in mottled tones of red and green. 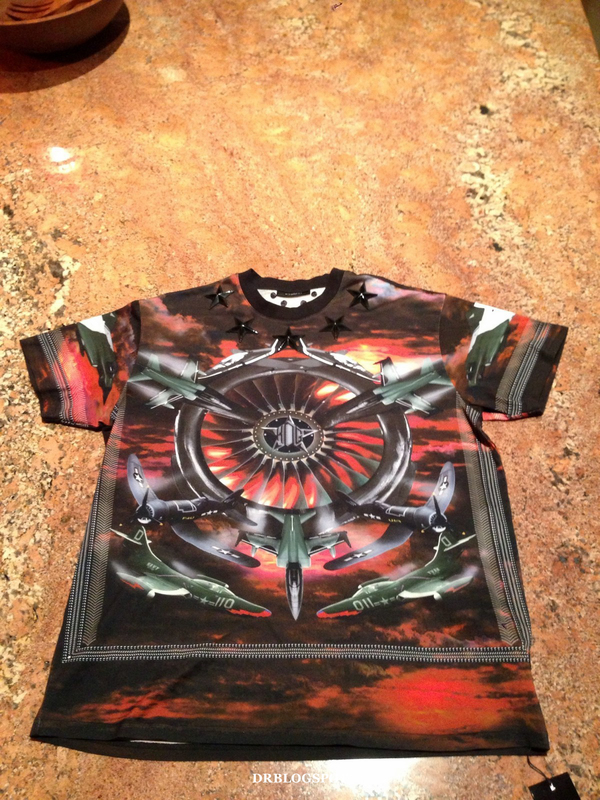 Signature vintage airplane print throughout. Contrasting ribbed knit collar in black. 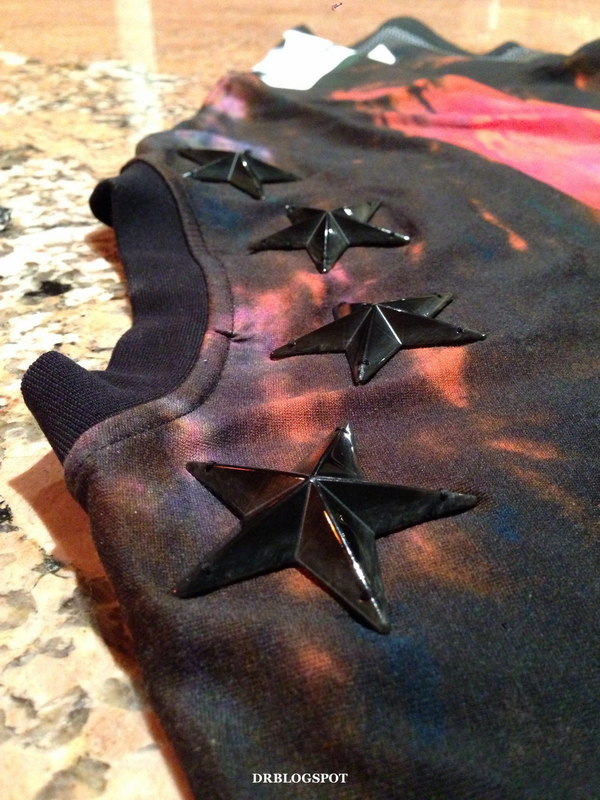 Black glossy star accents stitched at yoke. Tonal stitching. Body: 100% cotton. Trim: 100% polyester. Hand wash Made in Portugal. SOLD OUT . 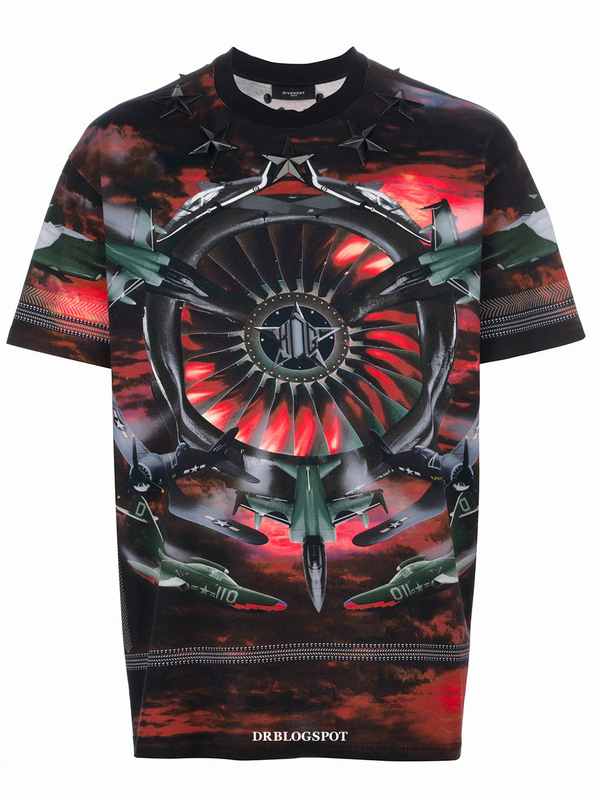 Shop the alternative Givenchy Green Plane Print Colombian-Fit T-Shirt at SSENSE . In another words, would u say that a slim version is not possible as I've seen some rich associates wearing the slim version n showing off on Instagram….. 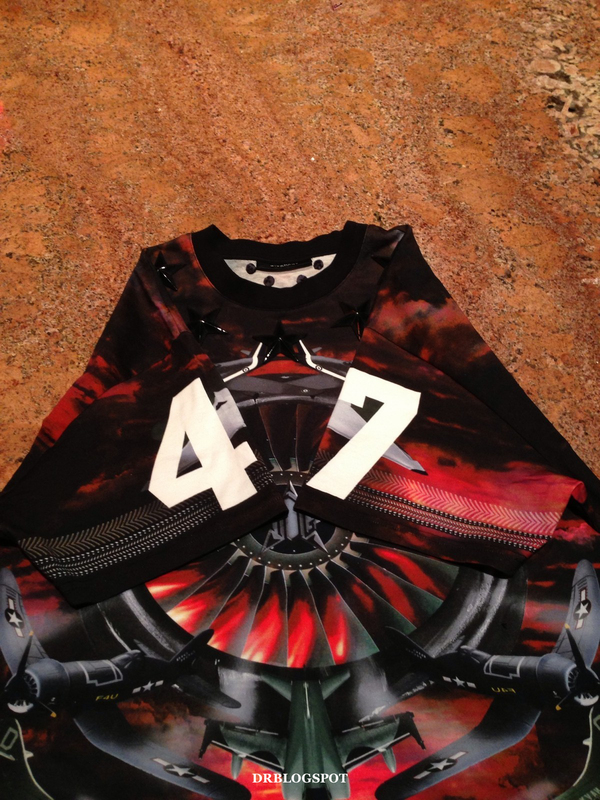 There's no slim version for Givenchy fighter design. 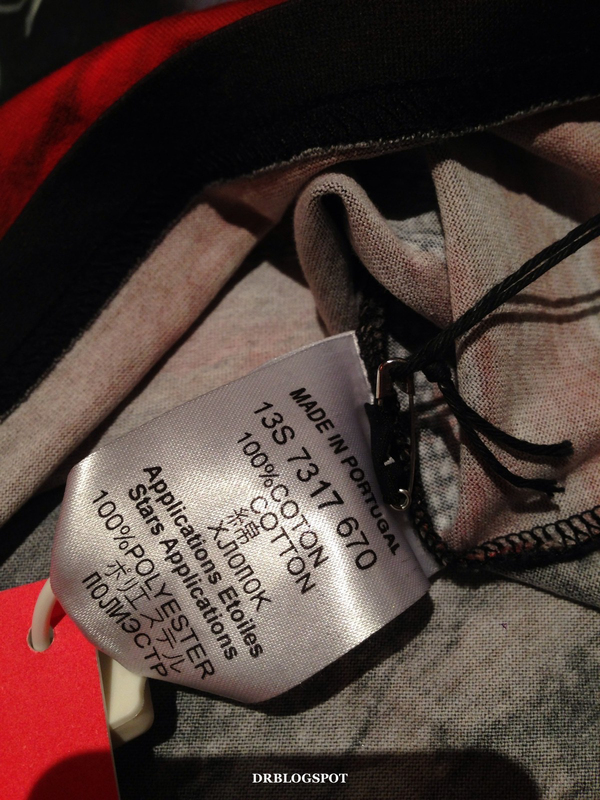 If you came across any, it is fake. 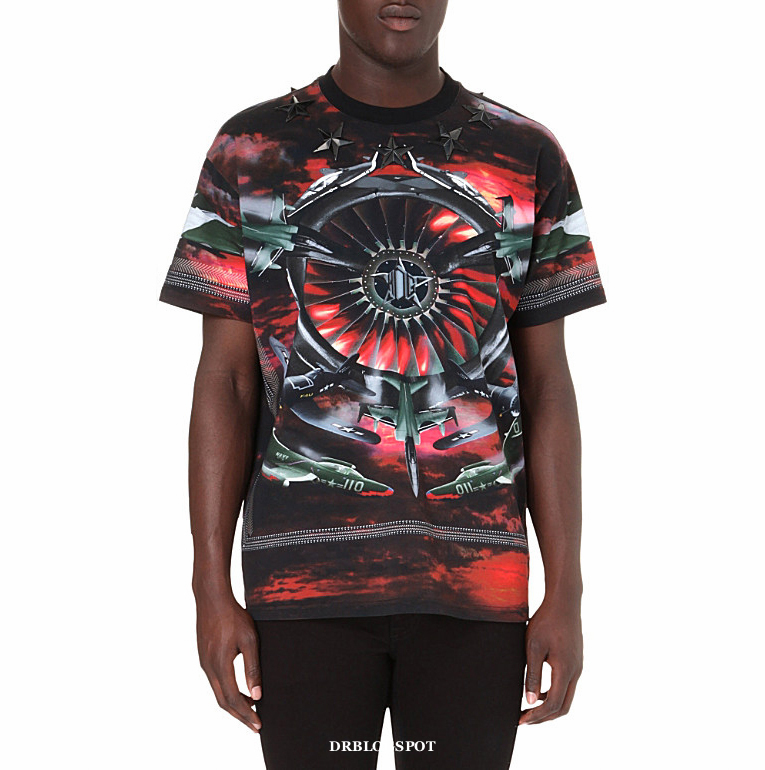 There are so many fake Givenchy red fighter t-shirts in the market. Just beware. 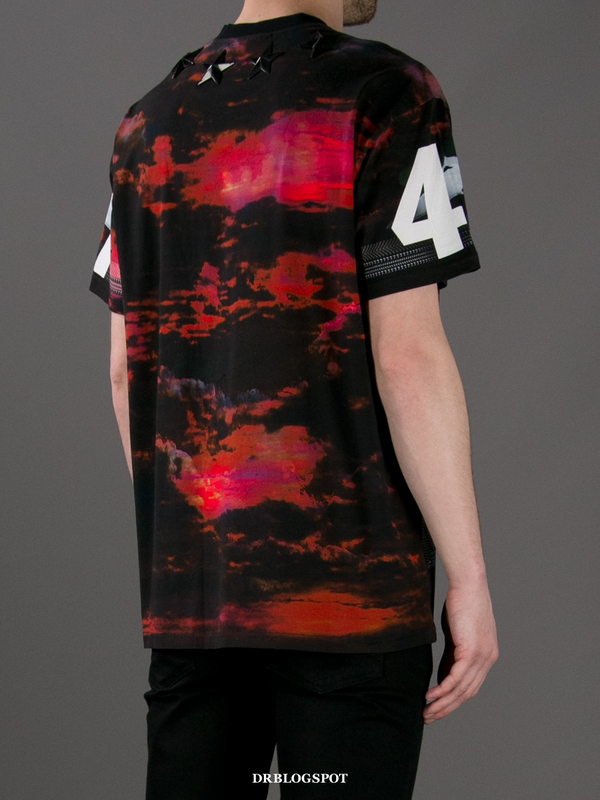 Whether to pay 1000 usd for t-shirt is normal? 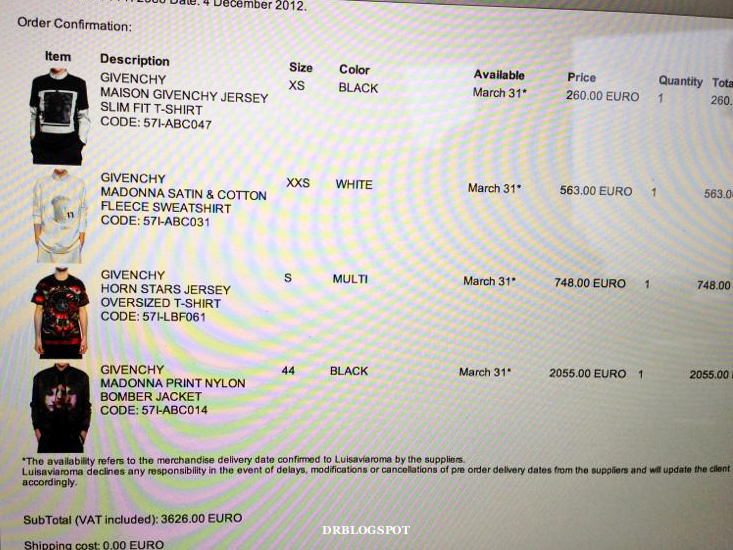 I don't ask these questions because Givenchy knows what they are doing when it comes to premium pricing. They are a luxury leading designer brand, top selling luxury fashion brand worldwide so they have a certain target market. If the price is affordable, then demand will outweigh supply. 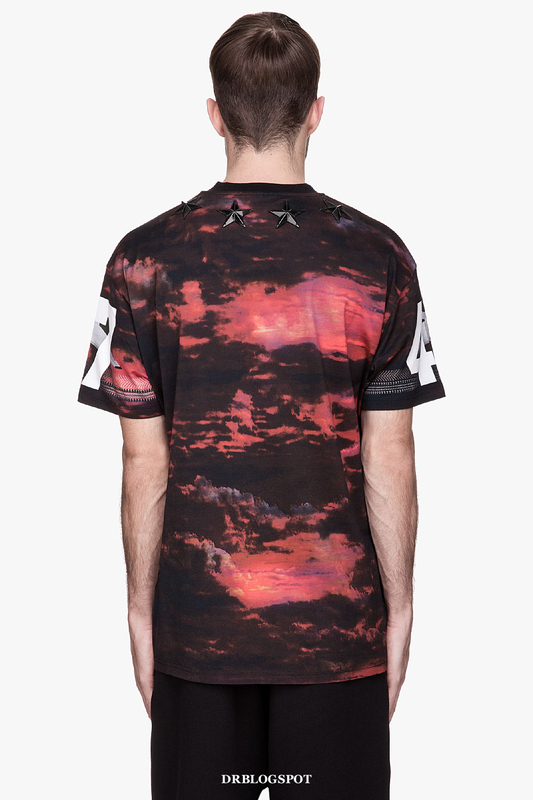 I dont think Givenchy is looking to expand so quickly to fullfil the mass market needs, you have to remember they are not ZARA or H&M. It's all about brand building and positioning. 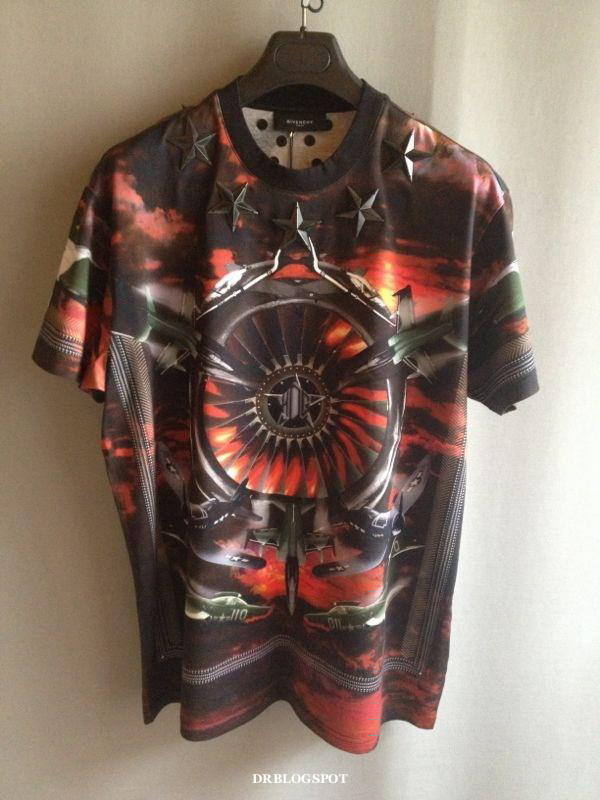 Do you think its a must have if someone already bought the Givenchy Green Plane Print Colombian-Fit T-Shirt? I was thinking about this for the past few days. I usually wear XL for cuban fit Tees from Givenchy, but for the Columbian fit i bought the Large size, for it is designed to be oversized. Looking forward to get the new one in the pre-fall collection. Btw thank you for the great info here in your blog, it is really helpful and up to date. 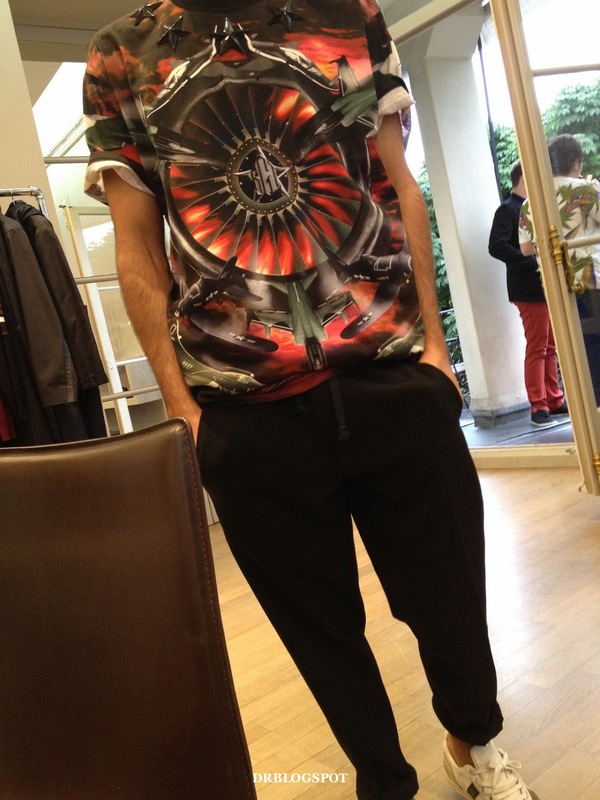 Not really a 'must have' if you already bought the Givenchy Green Fighter T-Shirt. But it is very tempting, I know it because I am in the same situation as you. 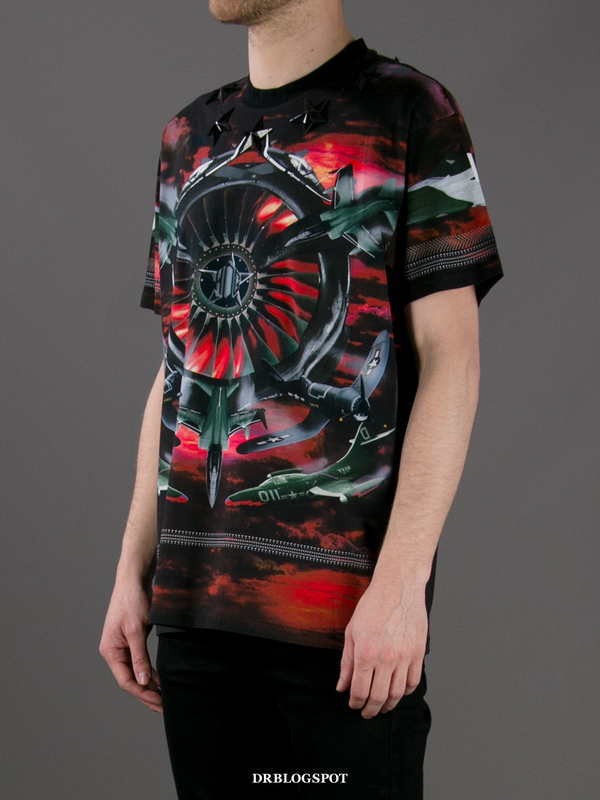 I want the Givenchy Red Fighter too, but I know I can live without it since I already have the Green Fighter, which is very similar and kind of pointless to have two expensive t-shirts in the same design? 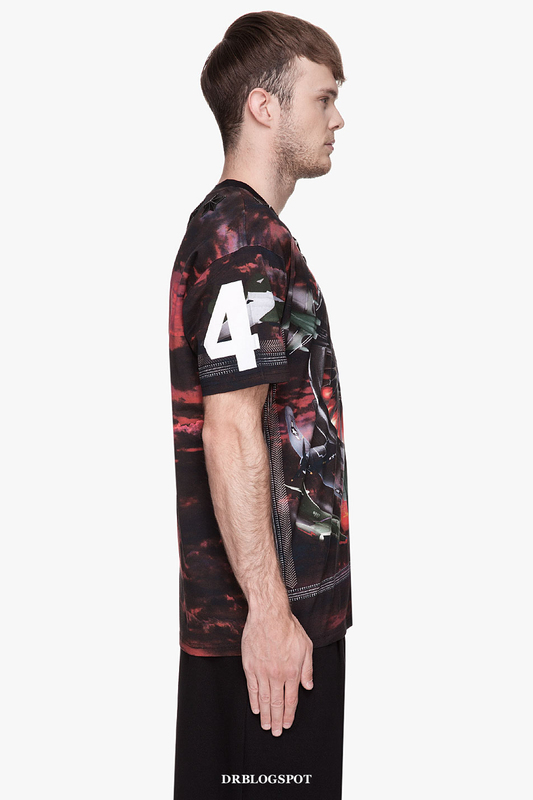 If you buy the Givenchy Red Fighter T-Shirt, you won't get the chance to wear the Givenchy Green Fighter T-Shirt since the Red Fighter is more expensive and more exclusive than the green. 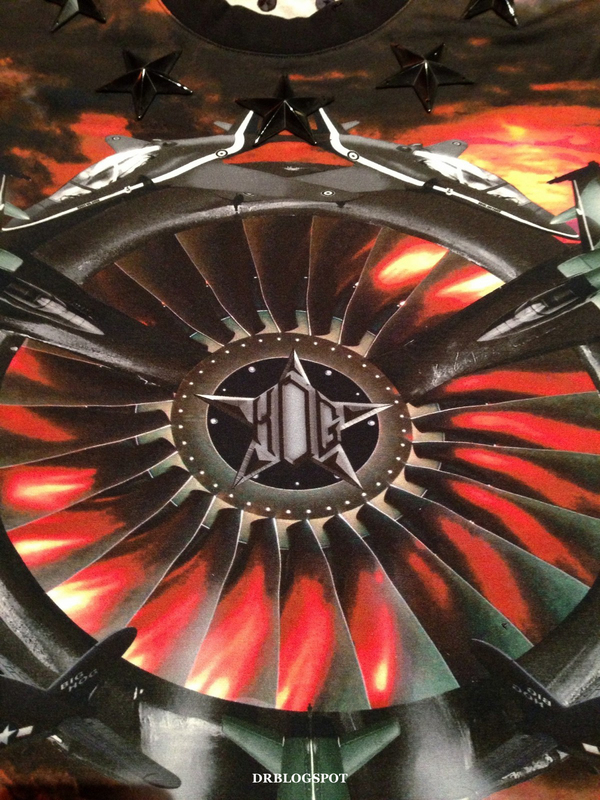 So I suggest is, buy the red fighter if you have the chance and money. Then try to sell the Green fighter once you received the Red. That way you won't be getting into the risk of loosing both. You can fit a size S or M as well, columbian fit is pretty big. I'm cuban fit size M and I wear size XS. Size S will be too big for my taste. Thank you for my reply. Unfortunately, i received it today and as you said both of them are expensive and almost holding the same conceptual designs. As for the fit, it is pretty big on me, but i am fine with it. I do not mind oversized tees, but to be frank i believe i could have picked a medium or even a small size and as i noticed from the product measurement there is a minimal difference between the M and L.
good thing i bought both.. the red and green one! Good thing i bought both.. Green and Red one! Didnt know it was in such a demand. Happy now!